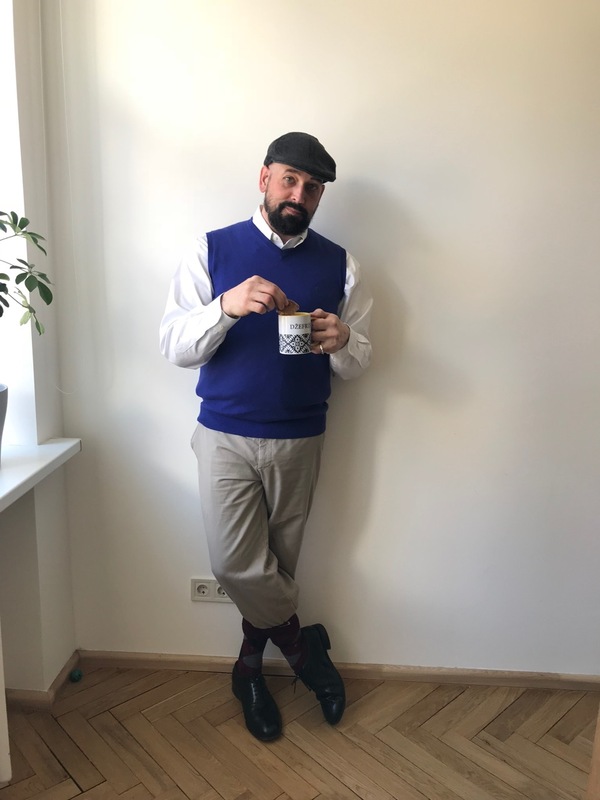 I was going to write a post last week about our cultural activities, but time is what it is and lo, here I am at the end of May pondering existence on a Monday afternoon. Enjoy! 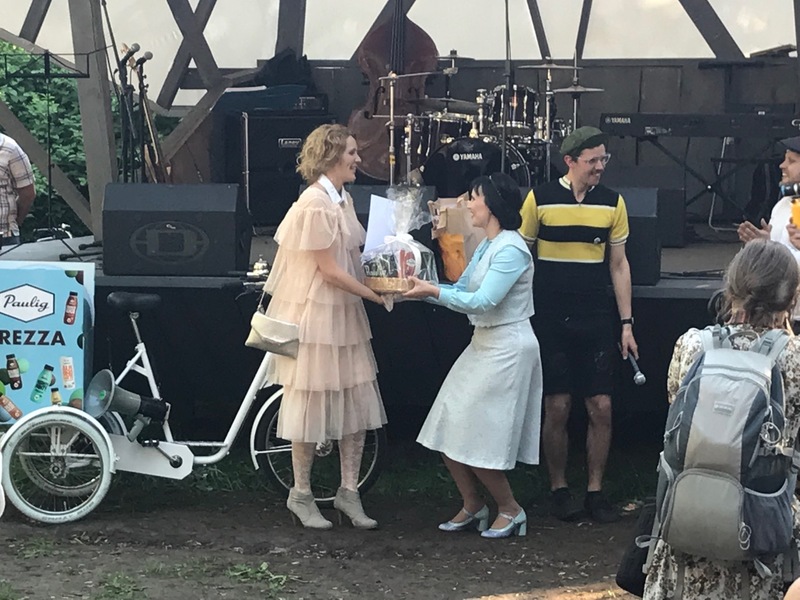 A few months ago, Rita and Anna brought up the idea of this bike ride in Riga where you get dressed up in “old-timey” clothes and ride your “old-timey” bike through Riga. Then, the idea would come up again every couple of weeks until the day actually came. You can see some official stuff here. We decided that we were going to do it, and in order to prepare, we went to the second hand shop for clothes. Remember that everyone in Europe is skinny, so finding used clothes is a challenge for me. However, I was able to find a nice sweater vest and a jacket (which did not get worn). Anna found a really cool 1950s looking costume. Rita decided to wear a lovely dress she already had with some accessories. I bought some tweedy socks, and I was good to go. 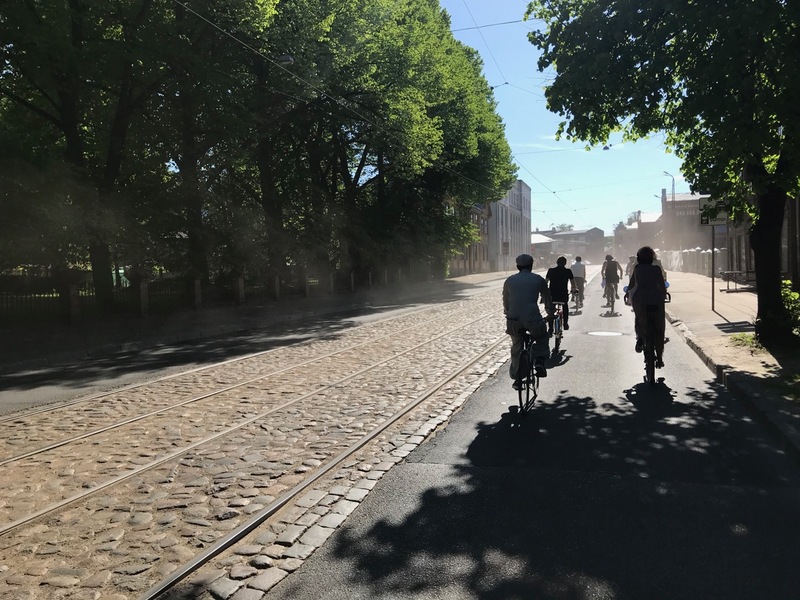 The ride was at 4 p.m. in one of the parks in the middle of Riga. It was unseasonably warm, but we steeled ourselves for the ride with a bottle of water and some sun screen. 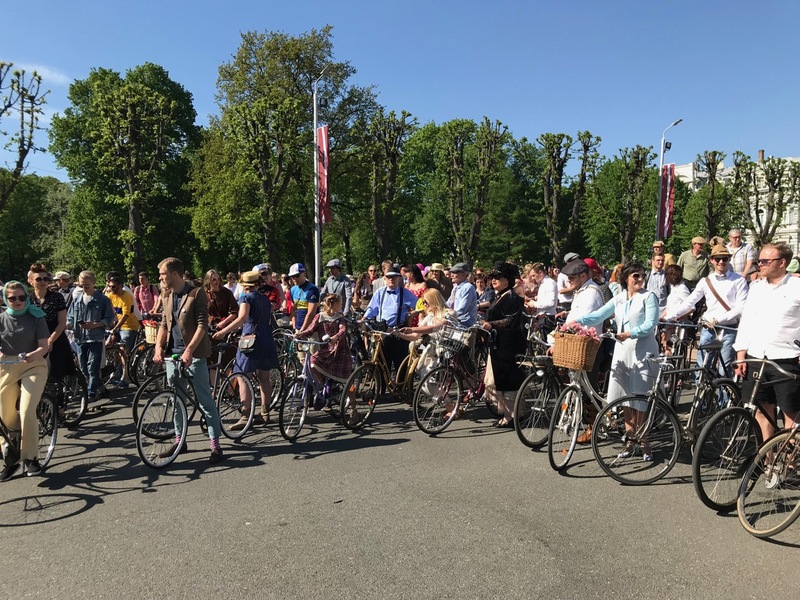 By the time we arrived, the park was full of people dressed fashionably in “old-timey” costumes with bicycles adorned in flowers and other decorations. We signed up for the ride, and I was participant 150. Cool, I thought. After some organization, the event coordinator started shouting in Latvian into his megaphone. I couldn’t understand what he was saying, but we all lined up and started ringing our bells. Soon we were off! I had no idea it would be such a well-organized event. We had police escorts to clear the roads for us as we merrily rode along. We stopped at the Freedom Monument and posed for photographs while tourists looked on. I met a lady participant who had a ferret in her basket. Quaint, I thought. Then we rode through Old Town, right through the Gallery Center mall. We were greeted by bubble blowing machines, and carried on through Old Town, weaving our way through tourists. 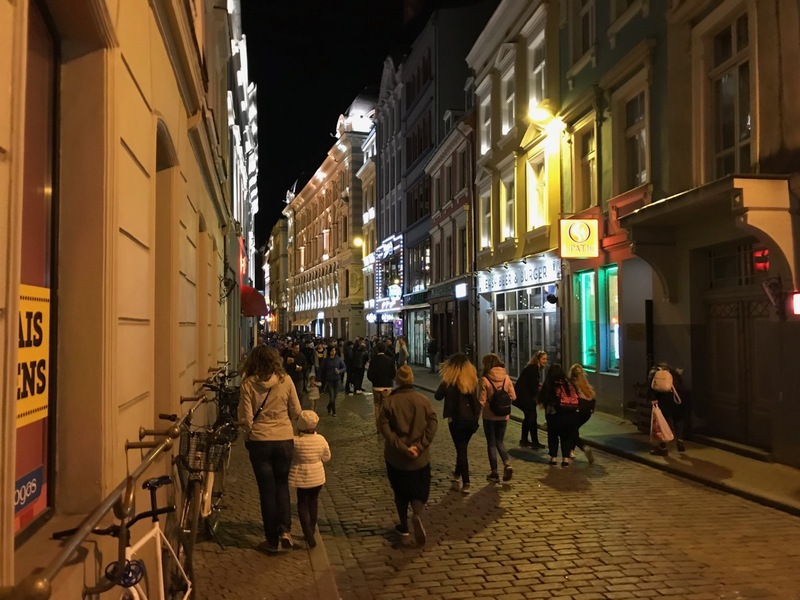 It is amazing how much busier Riga is in the spring than it was in the winter. After a brief pause for an ambulance, we resumed the ride and rode across Akmens Tilts, the Stone Bridge. It felt very special to ride with police motorcycle escorts and no automobile traffic. I am certain that drivers were not happy, but we were having fun. Once across the bridge, we went by the Soviet Monument and then along this promenade I had never ridden on before. It was lined by trees and just gorgeous on this sunny spring day. 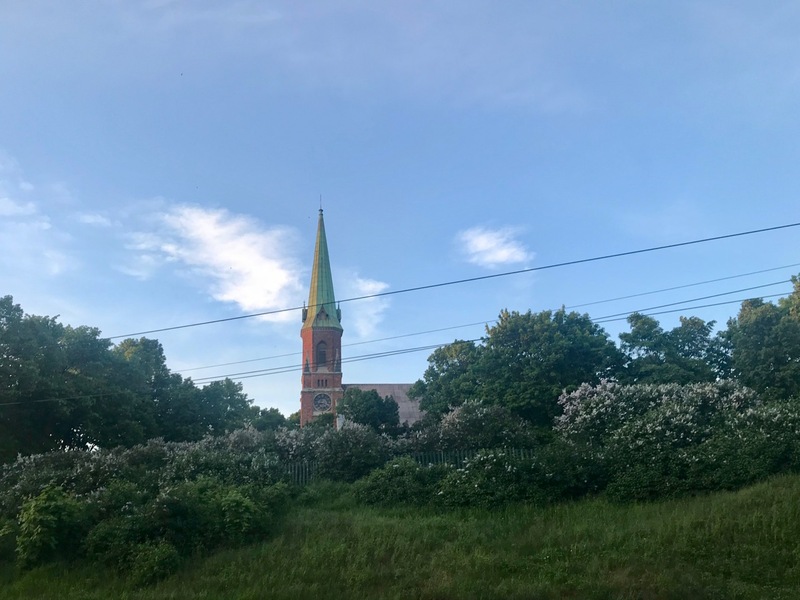 Eventually, we wound our way through the neighborhood streets until we came to Vanšu Tilts, the newer, albeit crumbling, bridge back to the other side of the Daugava. 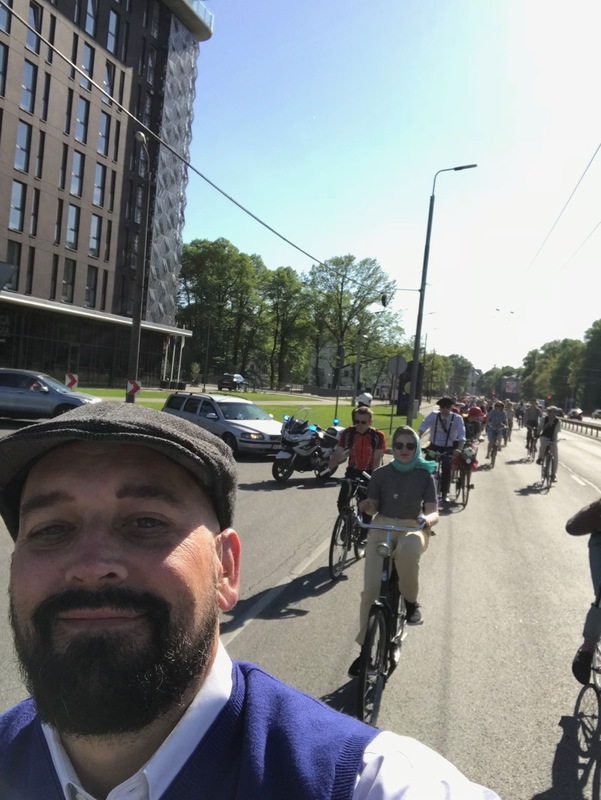 We made a loop past the Presidential Palace, under the bridge and on down Elizabete Iela. The ride finished after 10 kilometers or so at this hipster bar where we were served free drinks and treated to a musical show. They gave out prizes for best costumes and such. We didn’t win anything, but it was still a very good time. As we road together, I envisioned carless cities, and I just keep thinking how wonderful that would be. I am not sure why cars became the default mode of travel. I do sometimes wish I had a car to go out into the country and explore. Our last trip to Lithuania would not have been possible without a vehicle, but in the center of the city, they seem so superfluous. Imagine no parking, no potholes, no pollution. Just people walking and riding from place to place. I know there are flaws, but I can dream, can’t I? After a busy week of work and planning, Saturday arrived and I was treated to another European tradition–Museum Night! The idea is that all (most) museums in the city are free and people go with their families from museum to museum. Rita and Anna have been doing this tradition for awhile, so I was happy to join and go along for the ride. We looked at the list of museums and kind of decided a general area where we could go to some that we hadn’t been to and wouldn’t be as crowded as some of the more common ones. I was told to go to the International Hat Museum, but, spoiler!!! We didn’t make it there. We did, however, make it to the Riga Psychology Museum. 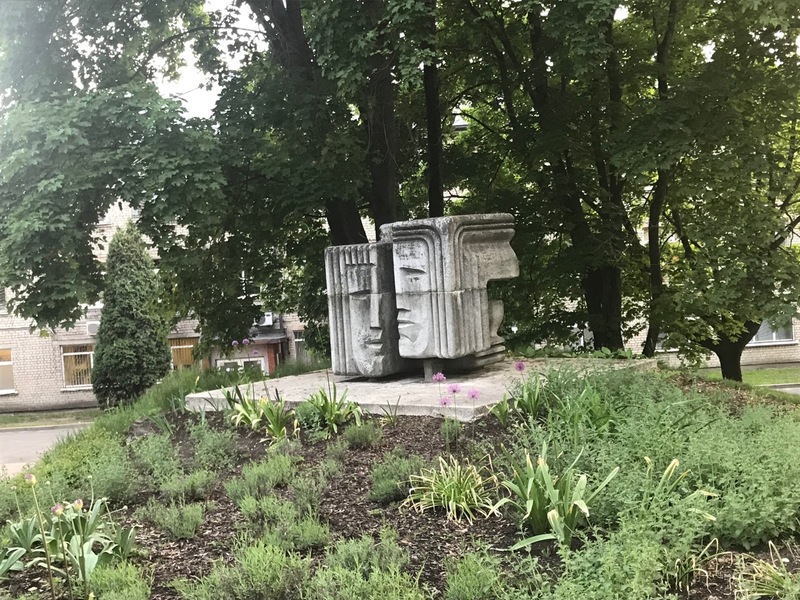 It is on the campus of a university hospital in the Sarkandaugava district of Riga, and I was under the impression that this is where mental patients go for recovery. As we entered, there were no signs or anything, so we just kind of wandered around until we saw some people so Rita could ask them where to go. The campus is surrounded by tall walls on all sides, so it was a nice surprise to see this wonderful garden stretch out before us. It was green as far as the eye could see with a fountain, lovely walking path, and a weeping willow to top it all off. It felt so serene and peaceful. The museum itself was pretty small, and most of it in Latvian, which I am still struggling with. They had a display of an artist who was living there for awhile in the early 1900s. His art was powerful and painful. I am still thinking about the meaning of the last display. It was a chair facing the wall sitting in a pile of grain with blinking lights intertwined under the grain. One of my students suggested it was representative of his mind. We are not certain. After we finished our tour, we walked to the Aldaris brewery which is adjacent to another museum, a a mansion in a park. Aldaris was the highlight for me. 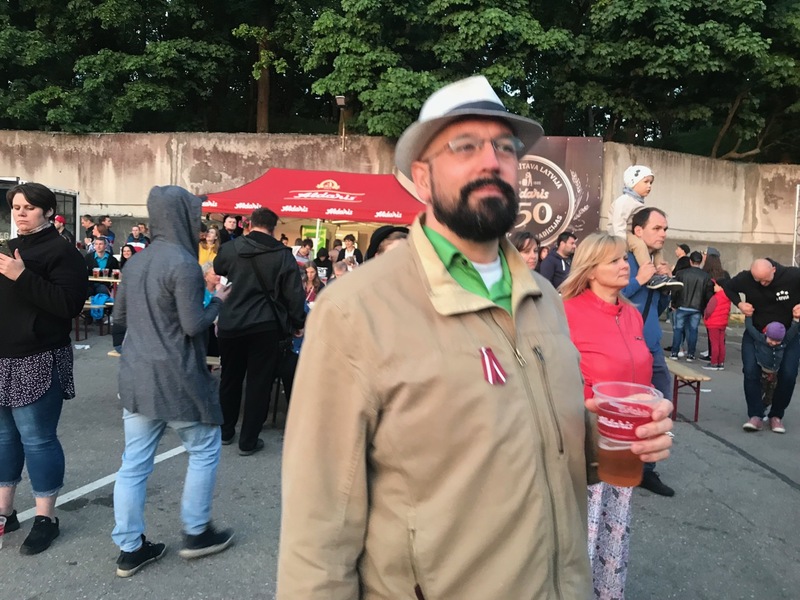 The beer was good and the price was right, and my new favorite Latvian party band was playing: Labvēlīgais. Omnibus! Everyone was dancing and happy. We toured inside the museum and saw how they make beer which is always fascinating. Then we went to the mansion which was given to President and UNL graduate Karlis Ulmanis. It is called Dauderi, and it was quite a lovely home on beautiful property. After the concert though, I think we were most thankful for the restrooms. We took Tram 5 back to Old Town where Rita took us to our final museum for the night: The Three Brothers. The Three Brothers are three of the oldest homes in Old Town Riga, and they were open this night with a special exhibition of some Latvian architects. It was just one small room with a few photos and some other displays, but the house was just lovely. You walk in and it is like a time machine with the stone work and exposed wooden beams. I recommend a visit if you get the chance! Then it was a walk through the rest of tourist-friendly Old Town and home again on good old Tram 7. Many other events took plac during these two weeks including seeing The Avengers: Infinity War. We rode to Meža Park and picked some lilies of the valley. I have watched the chestnut tree in our yard go from its winter colors to exception green to blooms of incredible white. The 12th grade students had their Last Bell celebration where the school celebrates their last day in style! The days are longer and longer, and the evening night never seems to fade. I have stopped drinking coffee. And the world, as it is, continues to turn. Just remember that wherever you are, you can find these adventures and spirited expressions of life! Take someone’s hand, and lead them to the lights!